Everything gets a little messy from time to time even our beloved Nature Table. Sticky hands and messy play can do a little damage but never fear all can be cleaned. With a little care your natural toys will last many lifetimes. 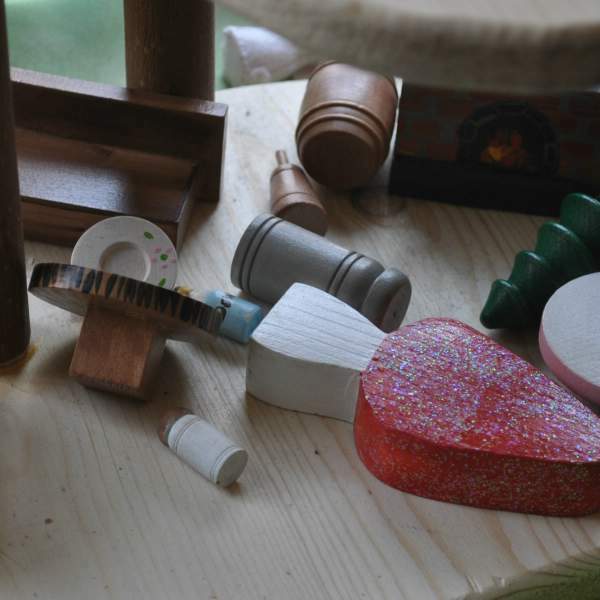 Regular care: Clean with a damp sponge, but do not soak unfinished wooden toys as they will absorb water. Alternatively, wipe gently with a cotton ball moistened with rubbing alcohol. Wood needs to have its natural moisture replenished in order to prevent it from drying out, warping or cracking. The best way to keep your wooden toys hydrated and well-nourished is with a natural oil or wax, like plain mineral oil or beeswax polish. Periodically rubbing with oil or beeswax will help refresh the wood and provide some protection. Stains/Discolorations: Fine-grade sandpaper may be used to remove any discolorations/stains (from food, crayons, markers, etc.). 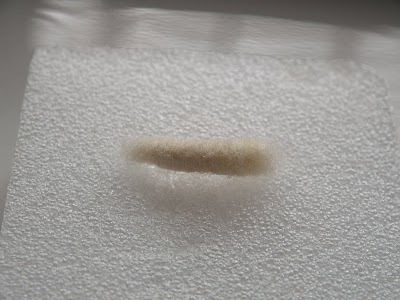 Water Damage: Fine-grade sandpaper may be used to restore the toy to its desired smoothness if the toy has been exposed to water and become rough. Regular Care: Wash gently and quickly with soap and water. Please do not soak them. Stains/Discolorations: Spray and wipe with a 50/50 mixture of white vinegar and water. Recommended care: Hand or delicate cycle cold wash, hang or air dry. Care: Spot clean with a damp sponge do not soak in water. Best kept indoors. Please leave a comment and share with us some ways you celebrate spring! 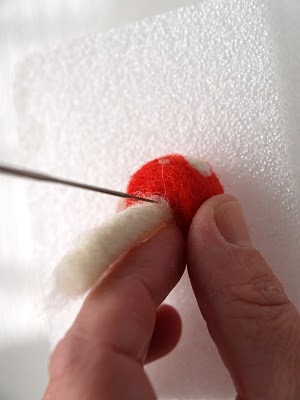 Tutorial – Needle Felted Toadstool. This week’s How-To is Tutorial – Needle Felted Toadstoolby Donni, from Fairyfolk here on the Natural Kids Team. 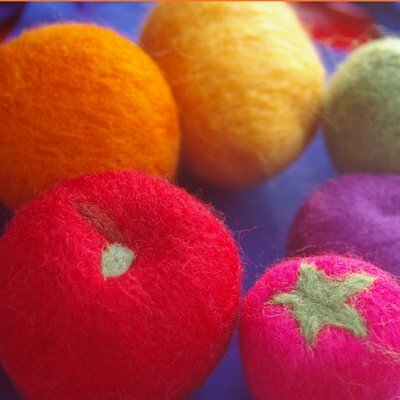 If you’ve ever had a chance to check out her blog The Magic Onions then you’ll know you’re in for a treat with a very detailed tutorial that you can follow even if you’ve never needle felted before! Enjoy!! 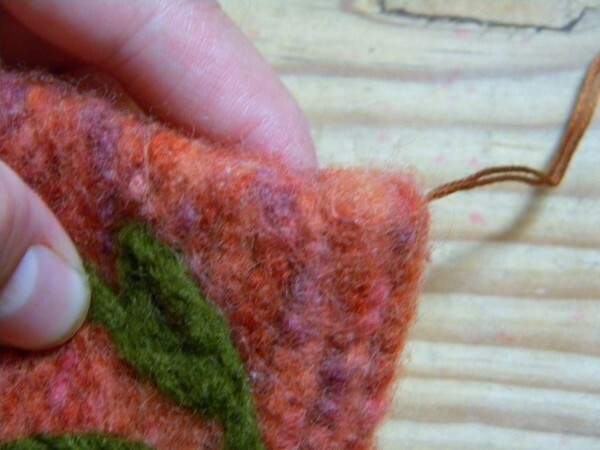 I am so excited to share a tutorial on needle felting. So many of you have shown interest in giving it a go and I encourage you to dive right in. 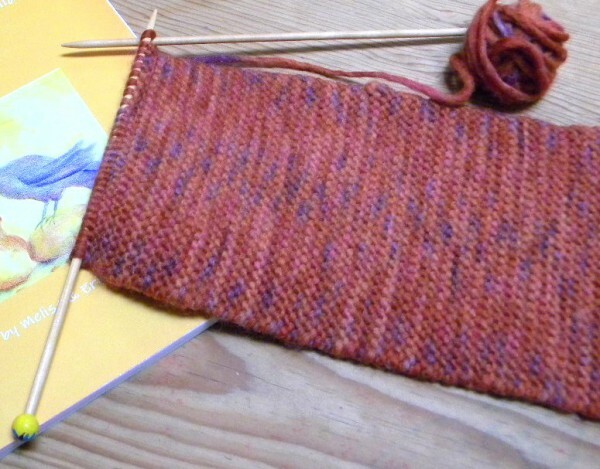 Those others of you who are hooked will agree, it is such a fun hobby and you’ll be amazed at the things you can make. When I picked up my first needle three years ago, I was surprised at how quickly I took to it. 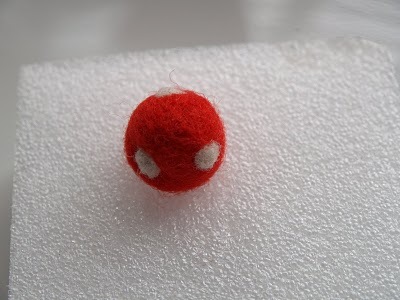 One of the things I love most about needle felting is that you can finish a project in one sitting. You can sit down with a basket of wool and be holding a delightful bunny in your hands an hour later. Of course, you can make wonderfully elaborate creations that take hours and hours but you can also make something in twenty minutes too. I like that. 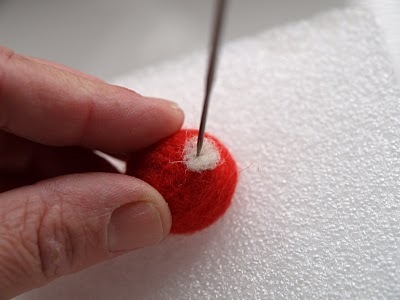 This is a tutorial on how to make sweet, needle felted toadstools… a simple and fast project for beginner needle felting. 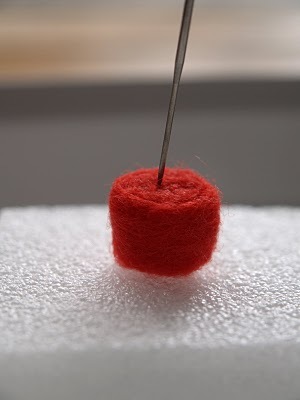 Equipment – Needle felting requires three tools; wool roving, a felting needle and a protective foam board. 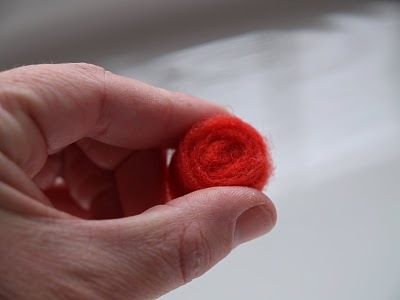 This roving can then be spun into yarn (for knitting) or it can be felted. 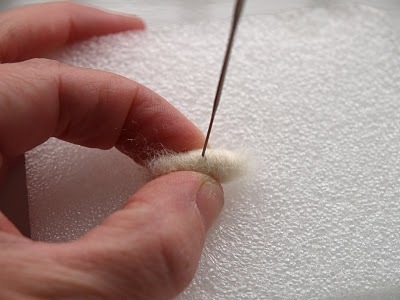 The protective foam board is not absolutely necessary but it is definitely recommended when you are learning to needle felt. 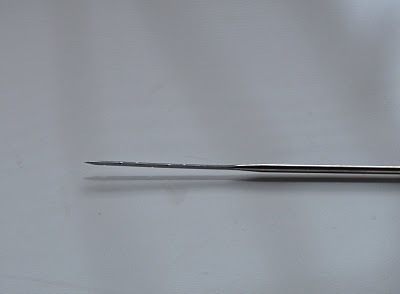 The needle is very sharp and if you don’t have a board upon which to steady your work, you will find yourself painfully stabbed more than once. wool roving about the length of your hand. roll a ball of playdough into a snake. 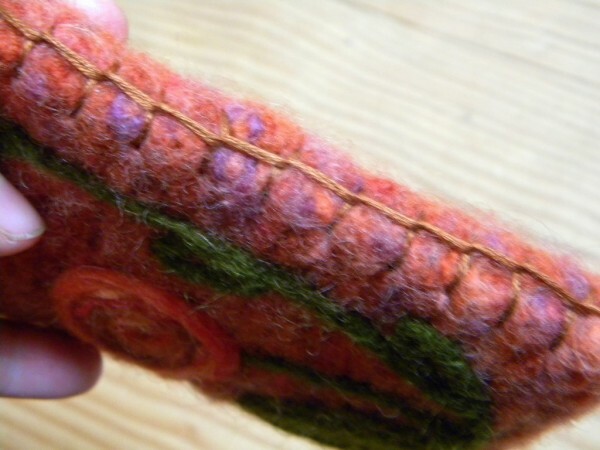 Roll the wool ‘snake’ into a tight spiral. The tighter you can get it, the easier it will be to felt. tightly to begin with, I can greatly reduce the time my form takes to felt. place and your spiral will not unravel if you let it go. stab the top gently many times so that it becomes a nice flat surface. When your underside is nice and flat, turn your spiral over to what will be the top side of your toadstool. 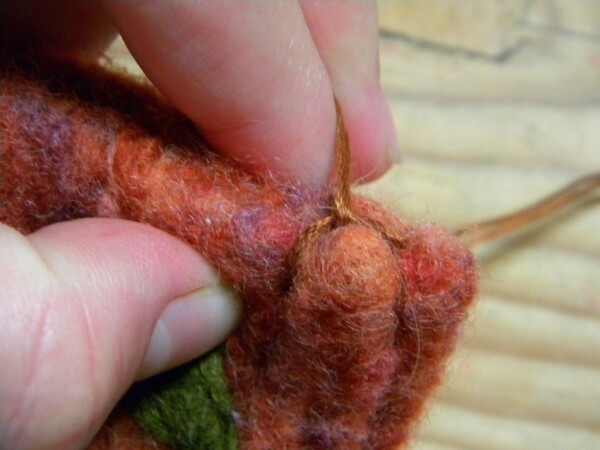 With your thumb and forefinger, gently pull the outside layer of wool a loose, just a little. 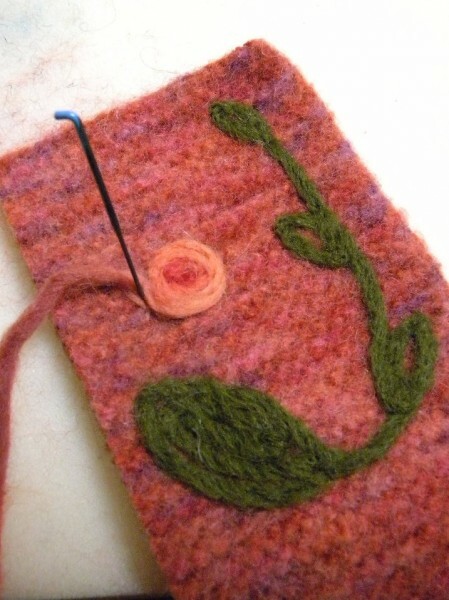 Fold this pulled layer over the spiral shape and needle felt it gently. 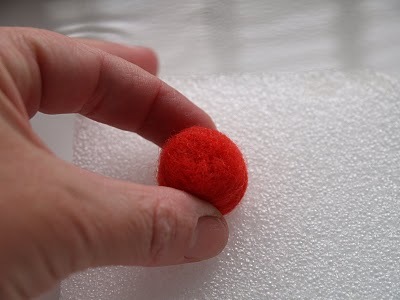 Continue needle felting it until it is a smooth round dome. 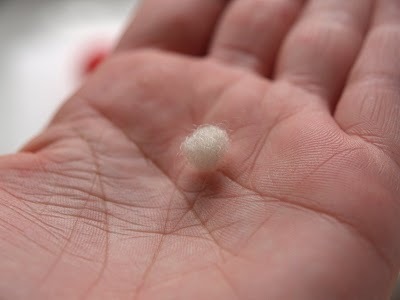 white wool roving about the size of your fingernail. Roll it in the palms of your hands until it becomes a nice firm ball. 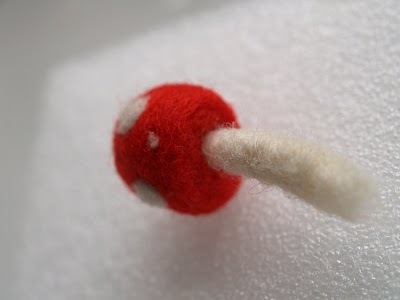 Place the white ball onto the red toadstool and needle felt it into the red wool. 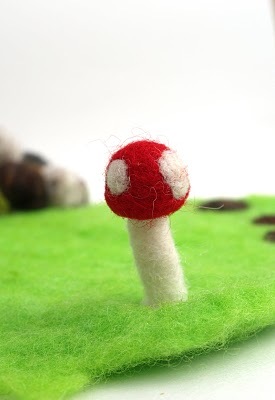 Needle felt as many dots as you’d like onto your toadstool. Now for the toadstool’s stalk. 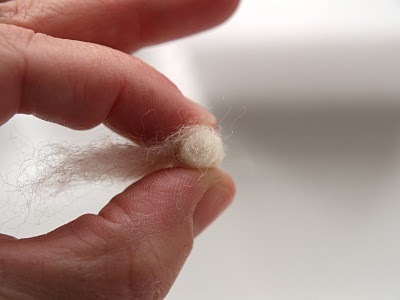 Take a piece of white wool as long as your finger and roll it in your hands until it becomes a ‘snake’ (as before). 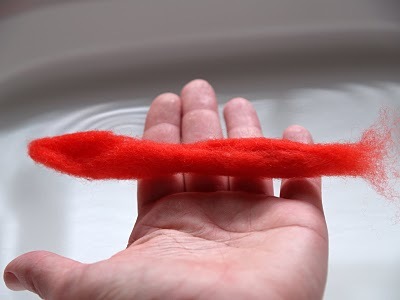 Roll it tightly into a spiral (just like you did with your red wool to start your toadstool). 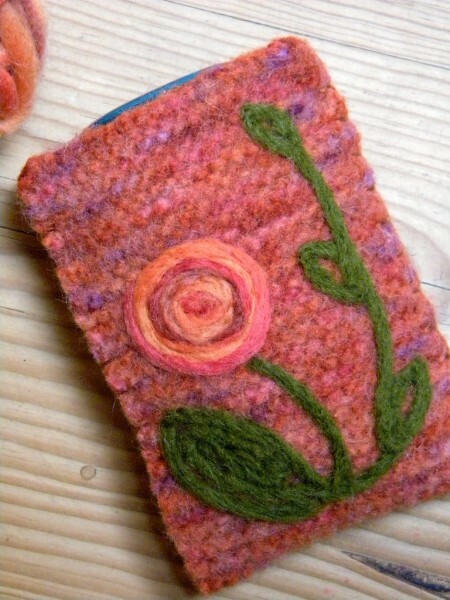 the outside until it is firmly felted and holds its shape. Leave one end of the stalk fluffy. 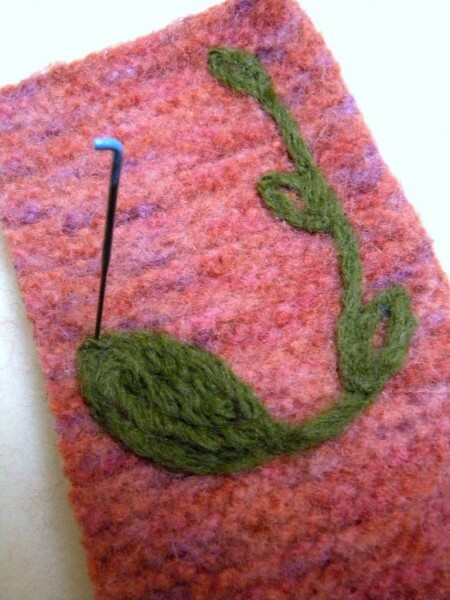 Gently needle felt the other end of the stalk until it is round. 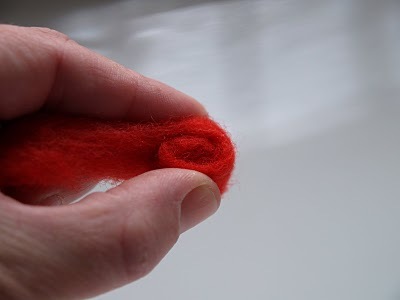 Place the fluffy end of the stalk onto the underside of your toadstool (the flat side) and attach it by needle felting it into the red wool of the toadstool. Gently felt around and around the stalk until it if firmly and neatly secured. Voila! You have made a darling little toadstool!! 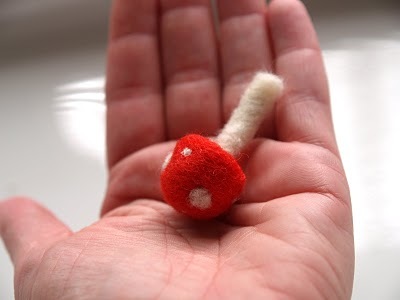 For those of you who want to give this a try, I’ve put together a needle felting toadstool kit and listed it in my shop. 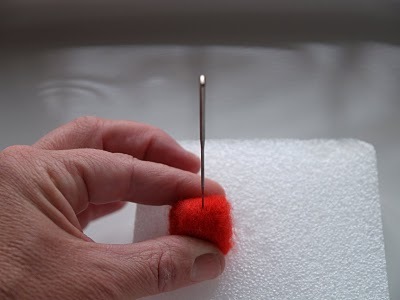 In the kit you will get two needle felting needles, a protective foam board and all the red and white wool you will need to make 10 little toadstools (or 4 bigger ones). 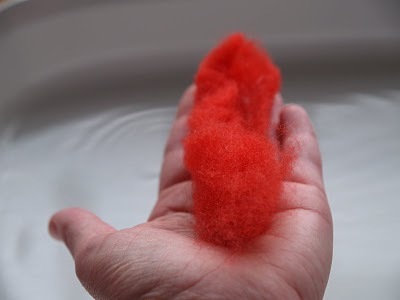 I also have beginner’s needle felting kits with lots of gorgeously colored wool if you’d prefer to try your hand at something different now that you know how easy it is. 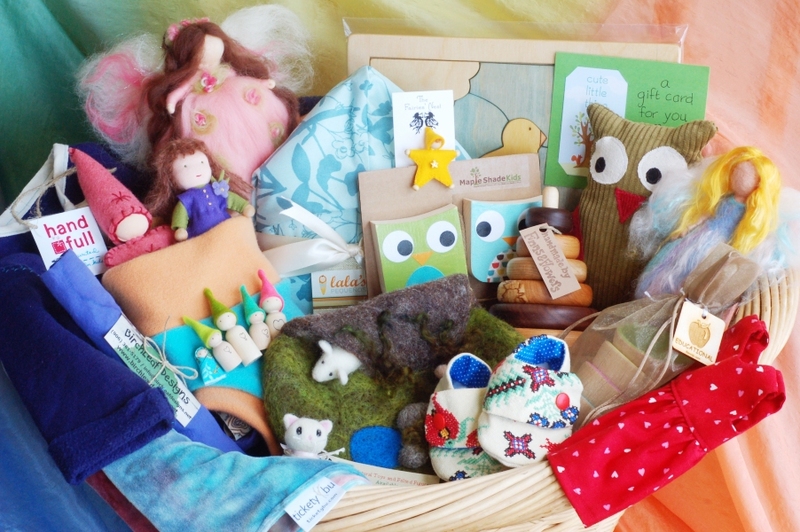 And, I have felted rock kits and felted soap kits available too. And, and, I have also put together a kit for making your child a felted playscape which is a fantastic project. 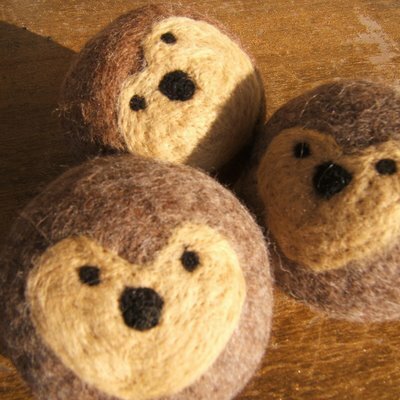 So, no excuse not to try needle felting if you aren’t already hooked 🙂 C’mon… it’ll be fun! Please visit Donni at The Magic Onionswhere you can see her original post and also visit her Etsy shop Fairyfolk. Nature Tables are used to celebrate the seasons and the rhythms of the year. As nature goes through its cycle of birth, growth, harvest, and sleep, so do we on our Nature Tables. 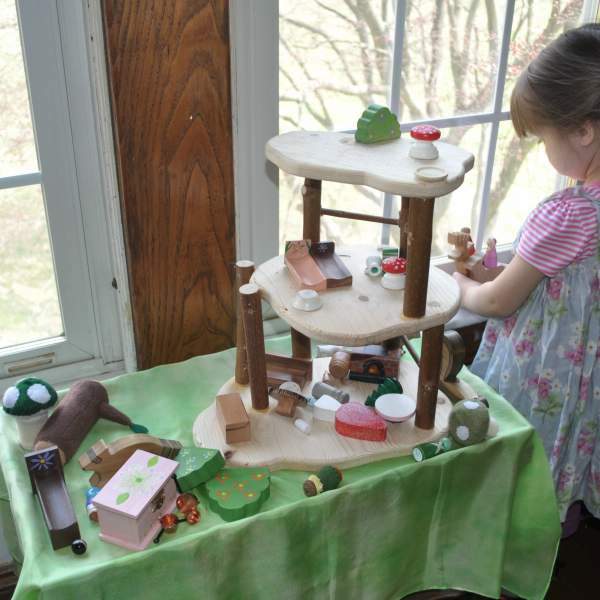 Using a nature table is a wonderful way to decorate your home and include your children in the seasons. Spring is on our doorsteps and just around the bend but it is still winter on our Nature Table. Before we leap into Spring, let’s look at some fun ways to celebrate these last few moments of winter. Any table will do as your Nature Table, either beside a wall or in a corner of a room. The size of your table will be determined by the amount of room you have to spare. The table you see here I got for $10 at a Junk Shop. I picked it for its size and that it had a nice shelf underneath to hold extra toys. 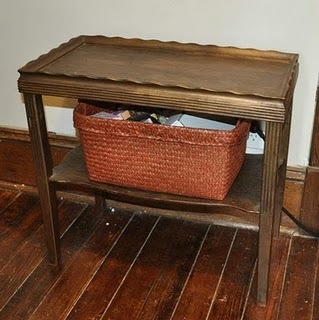 This table is low for the kids and fits nicely on the second floor landing. 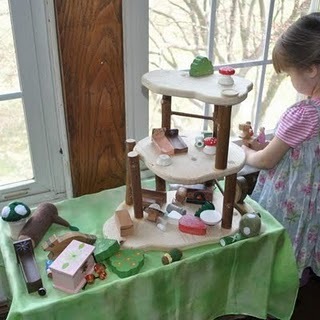 Nature tables are a great way to keep a little play place for the kids without having toys cluttering up the grown-up places. Playsilks are great from ground cover or backdrops. 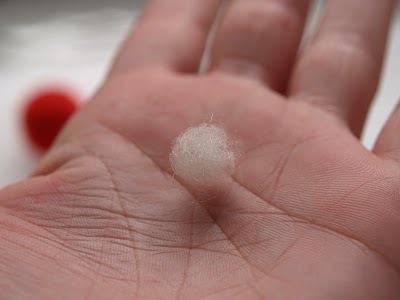 Some soft wool also make a nice snow covering. Adding some winter landscape toys will add to the scene. 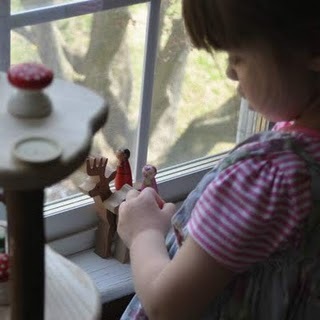 A lovely collection of winter theme toy like woodland animal, felted toys,and bendy dolls add just the right touch. Having a lovely decorated table will make you get excited for the season. If you don’t have a Natural Table but would like to start this wonderful tradition in your home, then follow along with me every other week. 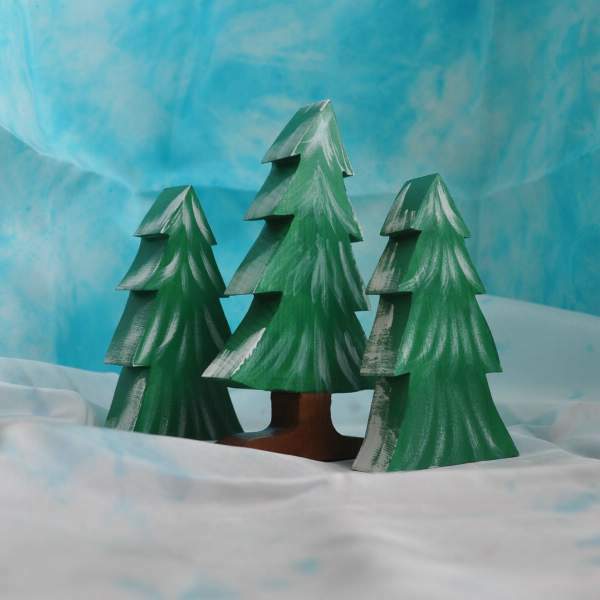 We will be exploring some traditional and modern ways of sharing the seasons with your family. Autumn is coming in her full array of colors. Mother Nature has one last burst of color before the great sleep under the layers of white. 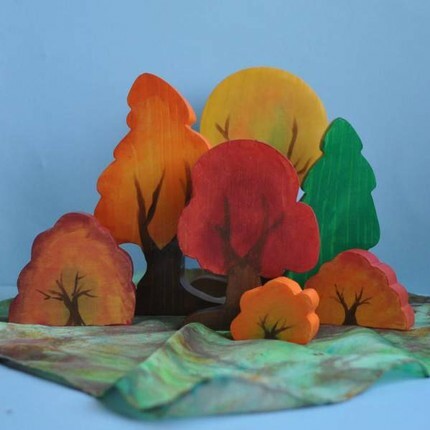 Here are some more wonderful orange items from the NaturalKids Team. We have a few new treasuries to share. Be sure to click on the links to find these great items on Etsy! 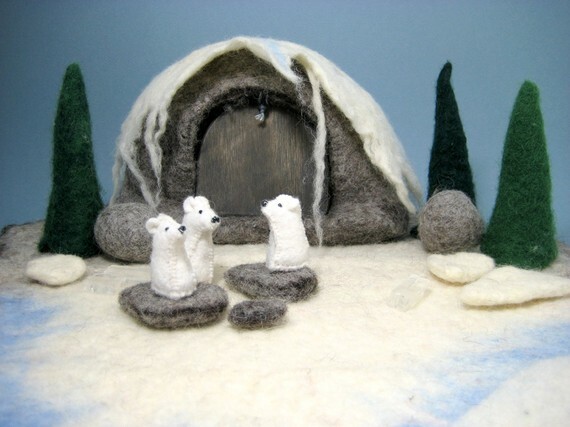 This treasury was made by Etsy administrator Daniellexo, after a needle felting tutorial with winsome hollow and little love blue in the virtual labs. 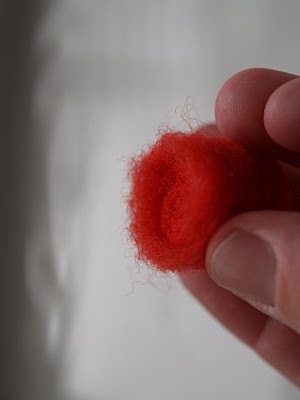 You can find the same needle felting tutorial in written form, with pictures as well! 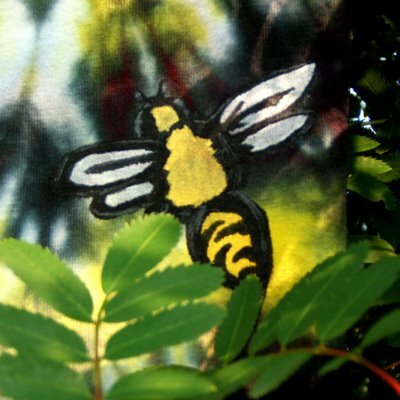 Today’s interview is with the NaturalKids team member, Beneath the Rowan Tree. Rowan’s lovely silks and toys are all hand dyed and hand painted and she has a wonderful eye for color. Come meet her…. Tell us a little bit about yourself and how and when did you get started with arts and crafts? I always felt like the ugly duckling in my family! Thank goodness my grandmother was naturally crafty and saw the spark in me~ this forged a deep relationship between us and strong connection in a family of non-crafty types. I have always loved to make things with my hands and to give them to others. Over the years I taught myself numerous crafts: knitting, cross stitching, sewing, scrapbooking and quilting to name a few. With quilting my love of color and texture really began to blossom. For me the best part about quilting was wandering through the fabric store without a plan, just heaping on bolts of fabric until a vision emerged. After my daughter was born, I dove into dyeing and painting clothing out of frustration about clothing available for kids. It turns out I *could* paint~ which was a real shock! Dyeing satisfies the need for color and adds the element of surprise and chaos which keeps me centered and reminds me that beauty emerges when we don’t try to control every outcome! 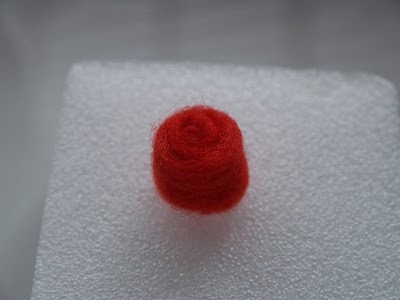 Most recently, drawn by the gorgeous colors and textures of fibers, I began needle felting and I am hooked~ it just resonates with me and draws together all of the satisfying and challenging aspects of craft and has pushed me along towards seeing myself as an artist. What is the main thing you make and sell in your store? What else do you make and/or sell? 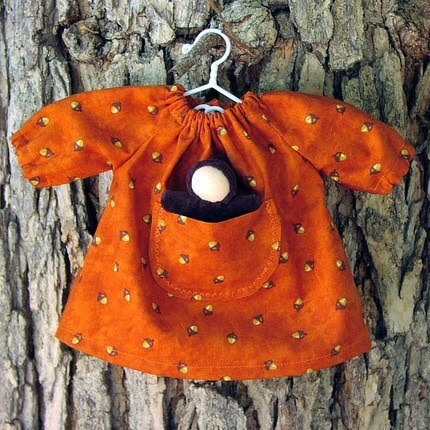 My core product has been my hand dyed and painted clothing for babies and toddlers, although with the holidays approaching and my mercurial interests, I am working much more on my natural toy offerings: wood, wool and lots of silk. Who if anyone has been instrumental in helping you hone your craft? I tend to be self-taught and a real grazer~ gathering tidbits of information here and there and generally running off half informed to work it out myself. 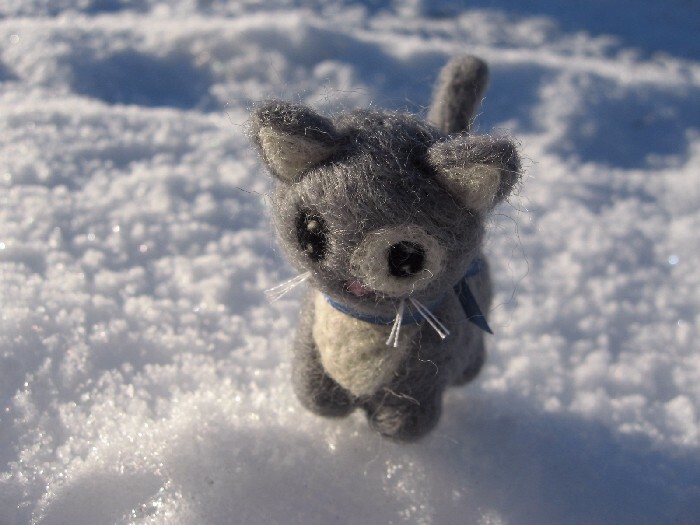 I appreciate the needle felting forums and community for direction, challenge and inspiration. 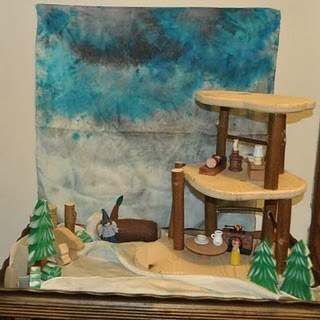 Everywhere, my child, the skies (every skyline calls out for a flat felted landscape these days! ), the seasons. I try to remain open (and keep notes). Since my crafting business is my ‘sideline’ to my full time vocation/ work I allow myself the freedom to follow my whims and do what I like. Wool and silk. So pretty, so versatile, so dyeable! What advice would you give to beginners in your main craft? 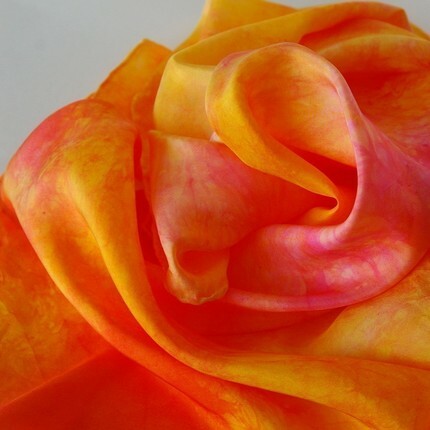 If you are dyeing, use quality chemicals, practice safety precautions, keep a clean work space and dye everything and anything you can to learn about color and fabric and results. Expect surprises. Be bold. You can always re-dye something, until you hit black, and then you bleach! Just kidding! What is your Etsy shop address and name? Where else can we find you? If you’ve been keeping up with the blog you’ll know that every other Friday there is a wonderful article on the Waldorf /Natural playroom. (If you haven’t been keeping up go back and read them now ’cause they’re worth your time!) Well today’s interview is with the author of those terrific posts, Nushkie, and I think you’re really going to enjoy getting to know her. realistically…I am still redeemed: my four-year-old daughter, Eva, likes to bring this ancient, gnarly artifact from Mommy’s past out whenever she needs something truly scary for a puppet show! Loathsome as my memories are of Mrs. Briggs, it was a time when schools still had arts and crafts as part of their every day curriculum. It is a crime that schools today consider arts, music and theatre as curriculum which is a “nice to have,” but not a “must have.” In addition to choirs, cello, piano, and all the school theatrical productions, I was always writing or drawing and painting. Horses and dancers, mostly, but occasionally some really surreal Dali –type explorations, like a volcano with a cigarette-wielding hand plunging from it into the sky …sort of burning the sky. My family was very musical, with lots of improvisation going on. Occasionally, we would just jam in the “music room” after meals. My brother Sam would play the drums, my other brother, the piano, my dad, the Lowry organ, my mom on tambourine or just dancing, and me playing the claves or singing. Eventually, I pursued much of my performance and writing interests through poetry, short stories, journaling, jazz singing, political theatre, one-woman cabaret, and even stand-up. Over the years, I also used my creativity in cooking, and have made my own home décor items, including pillows and curtains, small paintings, as well as clothes. 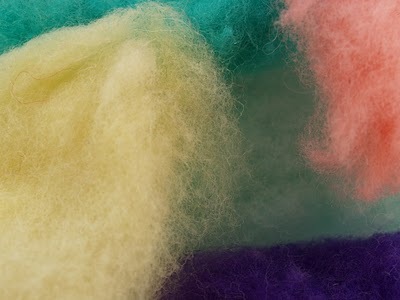 But it was last year when Eva enrolled in our local Waldorf nursery and I started mingling with all these fellow moms who live and breathe wool, that I rediscovered my interest in visual arts and my absolute infatuation with wool and felting! my friend Amy took one. 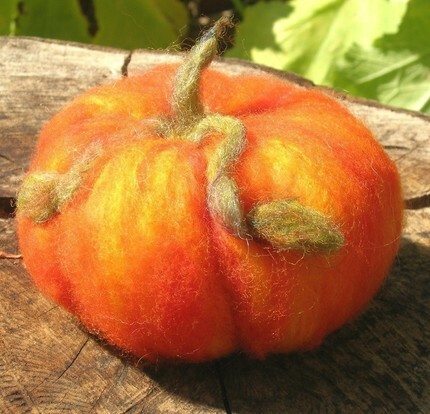 She showed me a needle-felted pumpkin she made…It was beautiful. 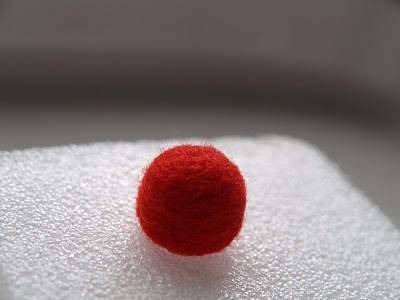 I said, “How did you do it?” She said she poked the wool with a felting needle. I said, “Yeah, I tried that with a regular needle. What’s the big deal?” Then she held up her needle. 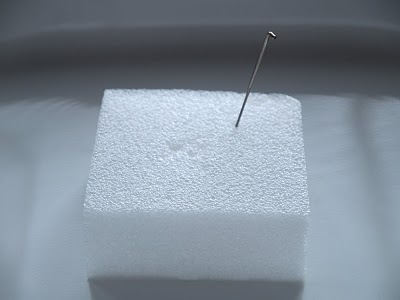 “Did your needle feel like this?” I felt the barbs along the side…and had a real “Ah hah!” moment. And that was it. I placed an order for needles, ordered fleece and proceeded to make pumpkins, fairies, playscapes, etc, for Eva, tapestries for her teachers, and dolls for her friends. I even felted a giant pair of butterfly wings for Eva’s Halloween costume last year. This was before I “honed” my craft. I stabbed them into our now fuzzy ottoman. Then, when they weren’t firm enough, I threw them into the bathtub and poured pots of boiling water on them and put on rubber gloves and massaged them with Trader Joes Purple Dish Soap. When all was said and done, they were beautiful but a little hot for wearing on a warm Southern California Halloween… It was the beginning of a beautiful addiction from which no 12-step program can cure me! wear to parties! 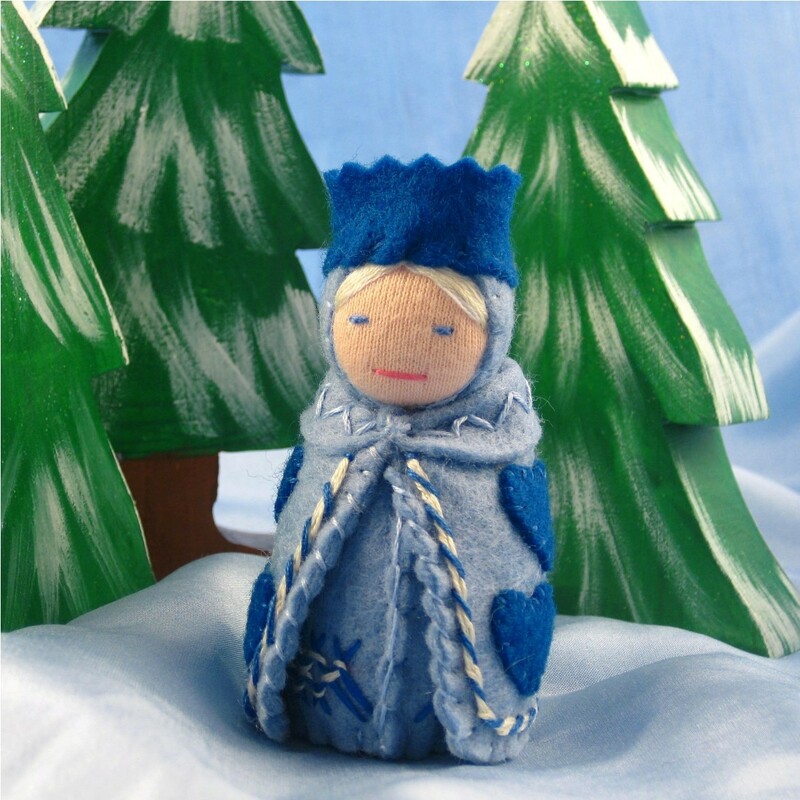 I plan to do more of that as we go along, but in the meantime, I have found myself tending toward needle felted tapestries, dolls, gnomes, playscapes, fairies and all things Waldorf. 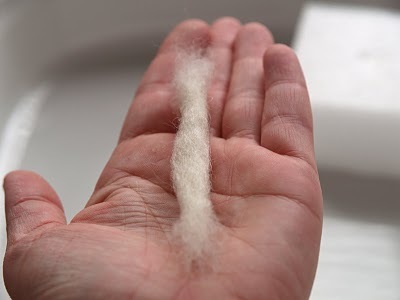 The natural and soft feel of the wool and the ethereal quality of what emerges in form offsets my darker, writing self, and creates not only beauty, but balance in my life. As I have made non-patterned “Waldorf” dolls for my little one and make practically all her clothes, I may branch out there as well in the future. Perhaps I will also finally make use of those shoe lasts! I think the felt covered diaries are a step in the direction of practical applications of this beautiful art form, as are the earrings I just posted. 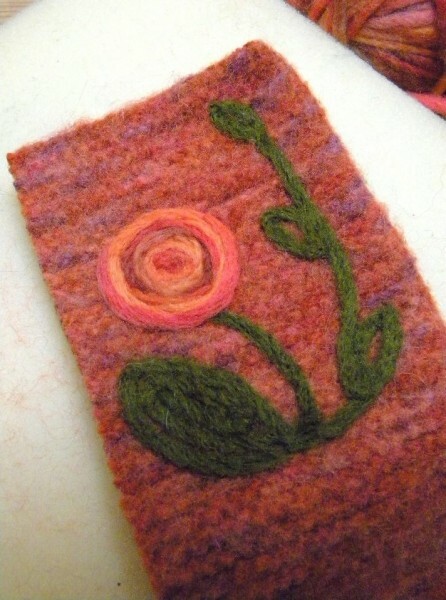 I also made her a cute felted light switch plate that I’d like to make more of. Speaking of Eva…the toys I make for her, the dresses, doll clothes, scarves and hats… It really all starts and ends with my little one… Her nickname is Nushkie. That’s why I’m Nushkie Design. Ok, I did just take a Eurythmy class (no, I still can not spell that word! ), but don’t usually like to take classes. I have found with acting and singing that I lose myself in trying to please a teacher. I tend to try to conform and try to be the “good student,” even when it doesn’t feel right. So, I don’t do it. I learned this with singing, that when I was studying, I was straining. When I practiced on my own I was fine. A few years ago, before Eva was born, someone my dad met had written an opera. He gave her my number. She called. When she asked if I was an opera singer, I said. “Yes.” I had never sung an opera before. I practiced like a crazy woman and auditioned and two months later, I starred as Anais Nin in a two-person opera to wonderful reviews. imes complain, “Please don’t look at my seams!” But she was a huge talent. She made beautiful things and was a wonderful cook. She opened up a successful clothing boutique with no business experience, and when she got tired of that, at 55, she decided to become an actress. Again with no formal training, she had quite a prolific career as a television actress until she passed away. It is really from her that I learned not to follow too many rules and to just follow my heart when creating. I guess I never learned to draw between the lines while coloring. Now I know it was a good thing! Thanks mom. Again, from my mom, but also my dad. He has a “can do” personality that enabled him to start a retail chain of organ (not internal, but keyboard!) and piano stores after convincing the Lowry Organ company to let him keep one organ and sell it on consignment. He rented a store, painted his name out front and that was the beginning of his becoming the national best seller of Lowry organs in the late seventies. Mostly these days, however, it is my little Eva. Her waking dream life is so joyful, so boundless in its creativity and, thankfully, so, incredibly contagious! Artistically, I’m inspired by anything beautiful that surrounds me. It can be writing, the more esoteric music of Kurt Weill; a film like “Wings of Desire”; the movement found in a Rodin sculpture; the emotion of a Van Gogh painting; the expression on a friend’s face; a song my daughter has improvised; an idea that pops into my head; the books of Elsa Beskow (what an incredible artist she was! ); other Etsy artists whose work I admire, such as fellow Naturalkids team members or felters from Nfest team. Let’s see…Wool, wool, wool and when I can get it, organic cotton…oh, and tree branches. What advice would you give other Etsy sellers and those interested in opening up a shop? Find something you love, make a few of them and open a shop. I think Etsy is the best deal in town. It would not be as easy or affordable to design and host a site and have the built-in traffic and promotional opportunities available to you that Etsy has to offer. Also there is this from my dad…I think one of the keys to his success was something he said to his sales folks. And it went like this, “When a customer walks in, don’t look at them with dollar signs in your eyes; Look at them and think, ‘how am I going to bring music into their lives.’ ” My goal is to bring my customers natural and heirloom quality creations that will add beauty and harmony to their surroundings. 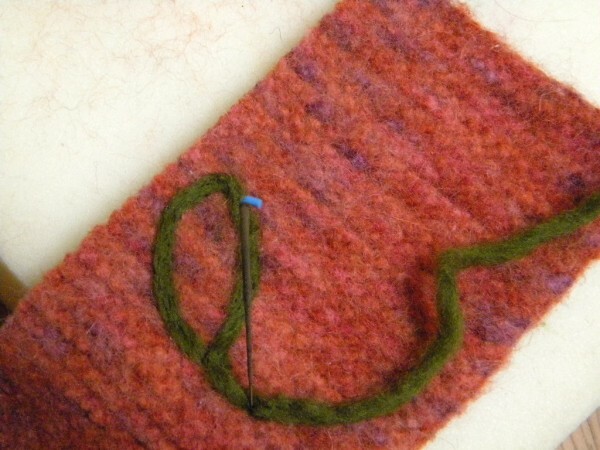 Invest in a felting needle and some fleece. Then experiment, but watch your fingers or, at least confine yourself to a sound proof workshop, as expletives will fly when that needle veers off into your finger during a rogue moment of exultant abandon! Take a class if you really need to but don’t get schooled out of your natural instincts. Try not to worry about how much time you have or don’t have. I do everything I do from about 9-11 pm after Eva is in bed and my inner cleaning elf has made some effort to unearth the bottom of our kitchen sink! Try not to be so verbose when being interviewed…ahem…and lastly and quite seriously, remove “I can’t” or “I’m not creative” from your personal lexicon and just do it. Get an image in your mind and run with it. “Good is the enemy of great.” So forget about having to be good at something and you will allow your greatness to emerge. Two weeks ago I began this blog topic. It is such a powerful idea to me, that children should be allowed to play without parental direction or instruction, that I decided to do the article in two parts. I am focusing on only one of the ways parents can step back and let their children do what they do best and naturally: play. That is, to provide them with toys they can figure out, which are open-ended, meaning the child can use her or his own imagination to complete the toy. It is difficult for some parents to understand this concept and choose a natural toy when they are bombarded by advertising from so many big “name” brands. In the first part of “Instructions Not Included,” I gave several examples from my fellow artisans from Etsy’s Naturalkids Team. I’d like to invite new readers to start with my last post. In this current post, I will continue to offer suggestions in this area with additional links. Here’s something to consider:I read somewhere that invention is not necessarily creating something new with a purpose, but giving a new purpose and way of using to an existing item. 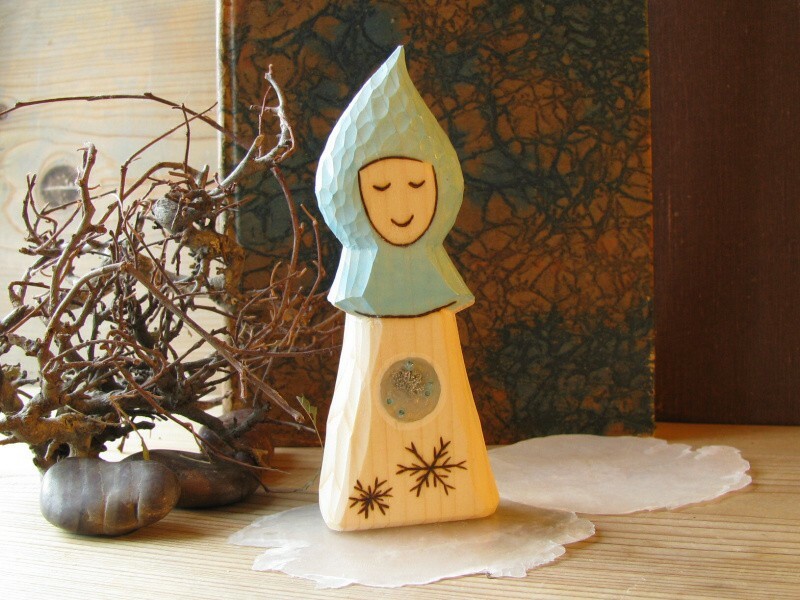 Take the item pictured above from Fairiesnest. Yes it is a wand…or is it? If so, is it for a wizard, a fairy a princess? The answers to these questions will be completed by the child. What new way of using this timeless toy will be invented, what enchanting scenarios may be created? And since it is not licensed or branded by a multinational corporate identity, the possibilities are truly endless. Woodcreations’….convey little expression. Like the “Mona Lisa,” they are enigmatic and allow the child to decide their emotional state. 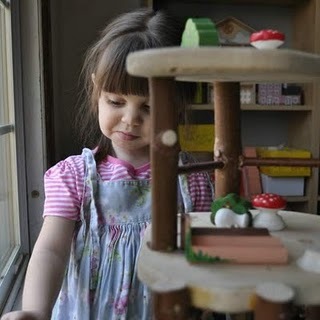 In imaginary play, this aspect of allowing the child to complete the toy by deciding if the baby is sleepy or awake, sad or exuberant, not only exercises the child’s imagination, but may also be therapeutic, allowing the child to work through emotional struggles. When Eva was 2, she slipped off the step in our pool. One second later, I lifted her out. This upset her nonetheless. The next day, she had her baby in the bathtub and was teaching it to swim. Clearly she was working out her feelings about water. Mommy’s only job was to wring the toy out later and allow it to dry! 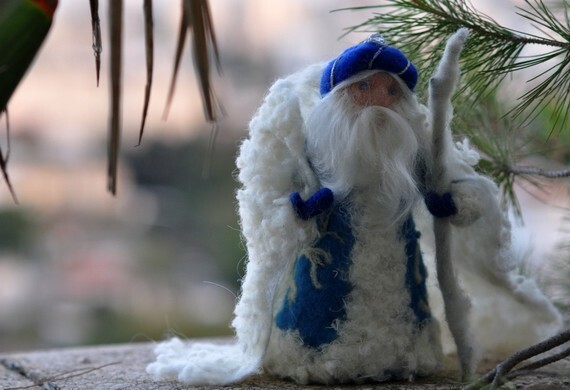 Here is a gnome by Oritdotan. Who is he? Where did he come from? Is that a shell really a cauldron with stew? This playset does not offer any solutions to these riddle. 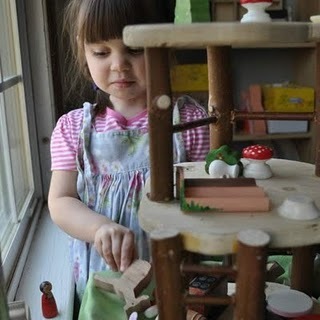 Instead, it offers endless possibilities for the child to imagine. Beneaththerowantree‘s gnome is quite different…almost a beehive…is he friendly or shy, abiding or mischievous? The child can decide what adventures to send him on, what his future in their present will be. And who are the gnome’s or the doll’s friends? 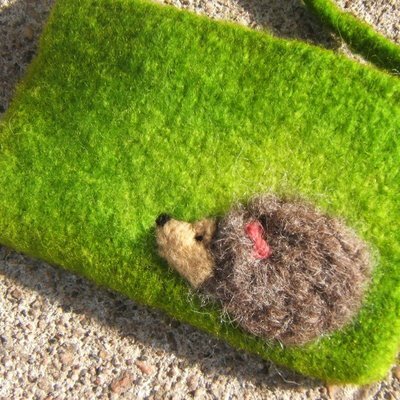 …or some tiny hedgehogs…by Purplemoonfibers. How about a snail from Woodmouse? Is it a really a cat or a woolly forest creature or someone from another universe. this is for the child to decide. The conversations and adventures these creatures could have with each other are endless, because they come free of history, branding or any other known fact. 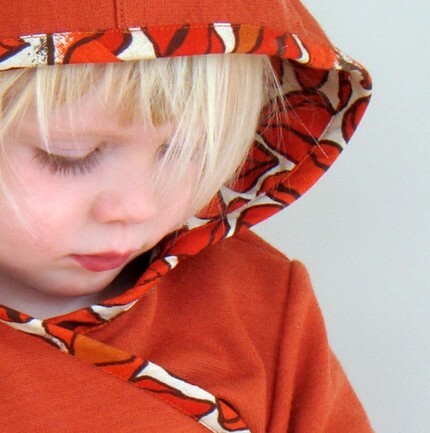 There are so many examples I could give from my colleagues on Etsy.com’s Naturalkids Team. But I hope these few examples will give readers a taste of the endless play their children could delight in with toys made from natural materials as they project their fantasies onto them. Like Cozycottage’s strawberries, the sweetness is there, ready to be enjoyed by all the senses, and it begins with the imagination. In my next blog, we’ll explore another aspect of the playroom. Til then, be well.